Hemsby Autumn Jazz Parade – Sadly the End of an Era! It saddened me to read Pete Lay’s announcement in the February 2019 Jazz Guide that there will be no more jazz events at Hemsby, Norfolk. 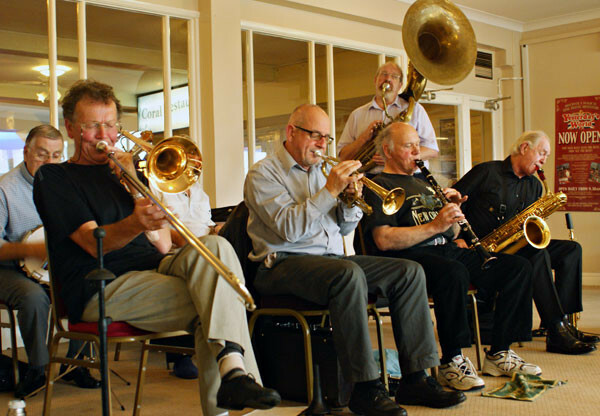 Pete stated: “I am sorry to inform all those jazz fans that have supported jazz events at Hemsby Holiday Village (née Seacroft) over the past 30 years that the decision is that Richardson’s will not be doing any ‘Adult Only’ breaks for 2019, and apologise that they will not be holding a Jazz Parade in 2019. “On behalf of myself and Heather, John and Renee Long and John Petters we wish to thank you for your attendance over the years. There have been many fine bands and wonderful music played in that time. “I will certainly keep you posted should this change at any time. The Hemsby Autumn Jazz Parade conjures up very special memories. The friends we spent the weekends with, some sadly now departed; the bands and musicians we met and befriended, some of them also no longer with us. Dancers displaying skills beyond description on the crowded ballroom floor. Fans crowding the full length bar back of the ballroom in deep conversation. The bands and musicians we met and befriended between their gigs on the impressive original stage. And of course the fun and camaraderie enjoyed at mealtimes in the dining hall. For me Hemsby clinched the way ahead and I took to photographing and painting acrylic portraits of the musicians and bands – followed later on by filming for my Jazz&Jazz YouTubes. live and alive in Hemsby! jazzandjazz.com has so much to thank Hemsby for. Fascinating to see and hear, brings back many great memories but after playing clarinet for over 50 years with many great ‘musos’ including Ken Colyer, Mac Duncan, Sonny Morris and my favourite Ken Sims I’m afraid it is no longer my type of Music as I now play trio/quartet swing jazz for mostly private functions.